Over the past few weeks I have spent an enormous amount of time having fun playing "Panzer Corps" for the iPad. 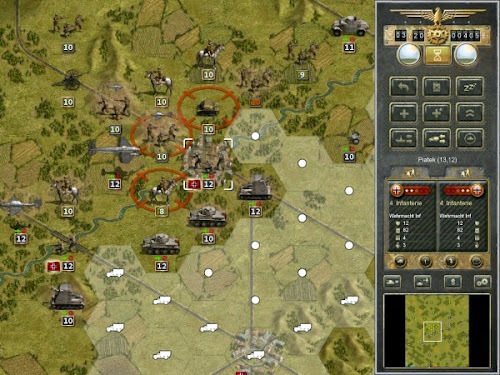 The game is produced by Slitherine (makers of the Field of Glory tabletop Wargames rules) and cost NZD 24. When I say the game is produced by Slitherine it is really just a faithful reproduction of the game mechanics, engine and playability of the 1990s PC game Panzer General II. And if you played and loved that game then you will absolutely love this one. You fight as an Axis General over one of five campaigns - full war, early war, Barbarossa, post Stalingrad and late war or you can pick individual battles/scenarios. There are five difficulty settings so it contains an enormous replayability. I tend to throw my resources into winning the air war and back this up with mobile pioneer units to take cities. This seems to work well but you can't afford to ignore artillery or tanks. Can certainly see this whiling away a number of wintry afternoons and fully recommend it if you have an iPad. Fantastic game, I've put far too many hours into and also love carrying your army with you from mission to mission!